AAAHH! 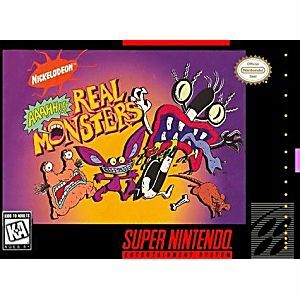 Real Monsters SNES Super Nintendo Game Cartridge Cleaned Tested and Guaranteed to Work! Greetings, terror-trainees! 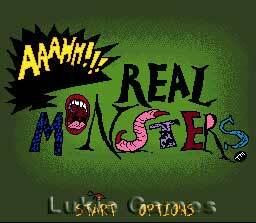 Ickis, Krumm, and Oblina will have to prove themselves on the Monster midterm exams if they want to call themselves real monsters! They must work together as a team to receive a single gruesome grade on their frightful performance. So...go out and petrify someone! When the cartoon first came out I laughed so hard because of Krumm (The monster that doesn't have eyes attached to his head but rather to his hands and he's also the one who has very hairy armpits) LOL!! Just trying to describe him makes me Laugh!!! I don't care about the quality of the game, I bought it anyway because I was a big fan of the show and who wouldn't want this in their collection?? I suggest buying it now because the price of these snes and nes games keep going up!!! Also, If you watched the show than yeah... The game is just as cool. AHHH!! 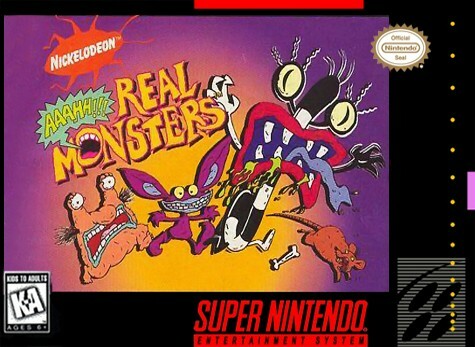 A Real Monsters Game! 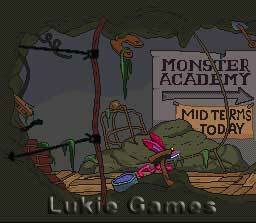 If you loved the show, you'll love this game.